Here at Socially Tailored we are quite smitten with Squarespace so anytime we see an email come through announcing new templates, it's time to drop everything and with a fresh cup of coffee in hand geek out over all the new designs. In case you are new to our community, not only do we use Squarespace for our website and blog but we also love it so much that we are Squarespace web designers working with creative small business owners, visionaries and bloggers. So new templates for us is like a new iPhone release for Apple tech junkies. We definitely think Squarespace is the bees-knees (you can read all the reasons why in this blog post). We can't wait to pour over them and get even more excited to share the 411 with our readers and followers so we were pretty stoked when we saw that Squarespace had announced 8, yes eight!, new templates for 2018. So without further ado, let's dive right into introducing them! The Vow Template has a very interesting scrolling format and design that takes the reader on a storytelling journey with timelines leading up to a special event. This would be a fun template for a newly engaged couple leading up to their wedding or a mom blogger who wants to take her readers on a journey through the months of her pregnancy. The Royce Template features a simple, bold format that invites guests to come together and celebrate. It's a sleek template that offers an online invitation type feel. What could be more fun than to send out a website to guests where they can see all the details of an event, party or gathering right from their computer or phone? And what could be easier than offering a way for guests to check out all the information and RSVP with the touch of a button. The Stella Template features lively colors and dramatic text to entice new clients to learn more about your services and book appointments. It has a simple and clean yet dramatic layout to drive home key information and clear call to actions. Great template for the health or fitness professional. The Kin Template is a charming with it's scrolling newsletter format. With the right imagery, this template creates a year in review format perfect for those holiday family updates and happenings. This is an image-rich template therefore good high-resolution photos will be important in pulling this look together. The Blend Template offers a sophisticated minimalistic design perfect for showcasing a small brick and mortar business and enticing customers with a bold header and scrolling banners. Great high-end photography will be crucial for this template. 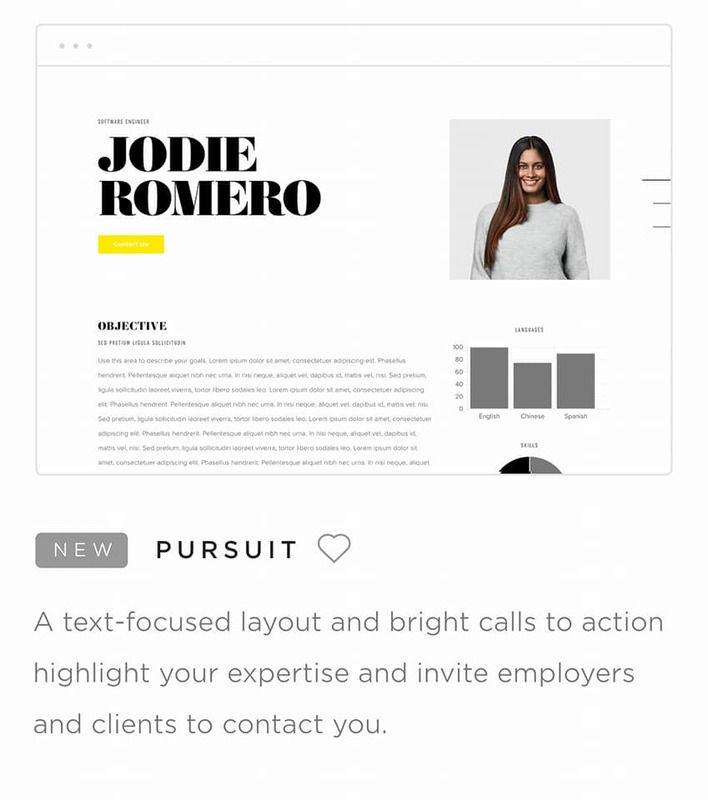 The Pursuit Template lends a more simplistic design that is text enriched. A few simple clean images with stellar copy is the focus of this website. Great for service-based professionals to highlight expertise, brand story and experience. The Pedro Template offers the opportunity to showcase lavish video backgrounds and images to take visitors on a visual story and encourage them to explore your products. This template is a great choice for an eCommerce brand. Good video production and photography will be a key element with this template. The Impact Template offers an attention-grabbing layout and bold calls to action promoting the mission and purpose behind your brand. This template is a great option for non-profit groups, online ministry and organizations looking to raise awareness of the causes they support. Squarespace never ceases to amaze us with their template designs and options. We hope you enjoyed this introduction to the new Squarespace templates for 2018. If you are looking to launch your own website and convey your brand story online, we invite to learn more about us and working with us in creating a customized website tailored to your business. We would love to learn more about your project! May God bless you and your business in 2018!